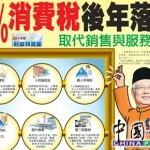 Home » Blog » Apply for Bantuan Rakyat 1Malaysia (BR1M) – RM500! 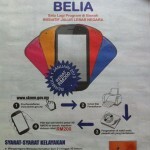 Download BR1M Form Now! Apply for Bantuan Rakyat 1Malaysia (BR1M) – RM500! Download BR1M Form Now! It’s a RM500 one-off aid called “Bantuan Rakyat 1Malaysia” (BR1M) will be given to a household with a monthly income lower than RM3,000. For those who are eligible, the registration will be opened until 10th January 2012 at various locations including schools. 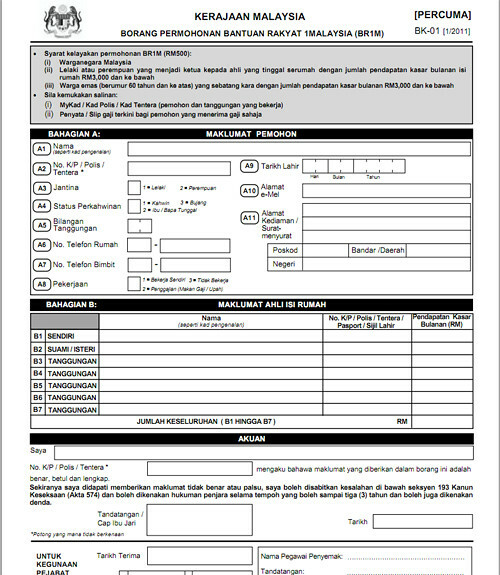 Registration form we be distributed via newspapers and also can be downloaded from Ministry of Finance website. The government is confident that the RM2.6 billion allocated is sufficient for 5.2 million eligible heads of households under the program. 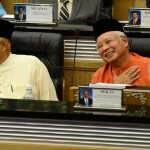 Should the number of eligible applications exceed allocated funds, the government will increase funds to assist households earning below RM3,000 and with many dependents, senior citizens aged over 60 and those registered under the eKasih program. 5. 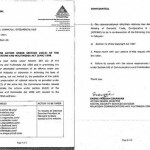 Borang yang lengkap di isi berserta salinan Kad Pengenalan hendaklah diserah untuk proses pendaftaran di Jabatan Pembangunan Persekutuan/Negeri, sekolah-sekolah terpilih serta pejabat-pejabat cawangan LHDNM. 7. Bantuan ini dijangka dapat memberi manfaat kepada seramai 5.2 juta isi rumah atau 79.5 peratus daripada keseluruhan isi rumah di negara ini. Pemberian ini melibatkan anggaran peruntukan sebanyak RM2.6 bilion. 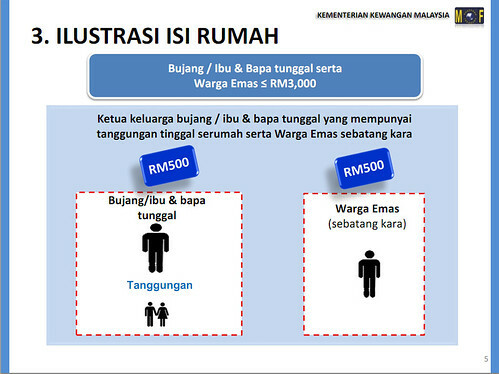 The eligible head of a household would have to bring a BR1M application form, a copy of the applicant’s identity card and latest pay slip (if applicable) when making the application. 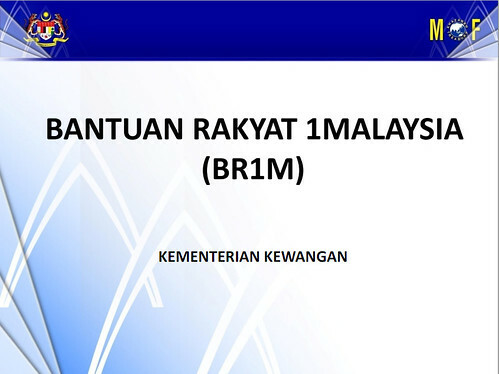 The BR1M forms are available free at all branch offices and services centers of the Inland Revenue Board (IRB), Information Department, Federal Territories Development Department and government agencies as well as at the main lobby of the Finance Ministry in Putrajaya and selected schools. – Lelaki atau perempuan yang menjadi ketua kepada ahli yang tinggal serumah dengan jumlah pendapatan kasar RM3000 dan ke bawah. – Warga emas (berumur 60 tahun dan ke atas) yang sebatang kara dengan jumlah pendapatan kasar RM3000 dan ke bawah sebulan. 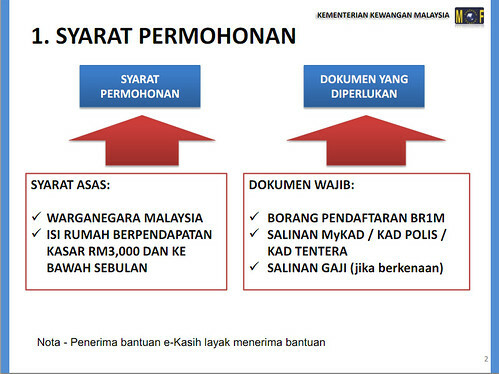 Download the Bantuan Rakyat 1Malaysia (BR1M) form now! 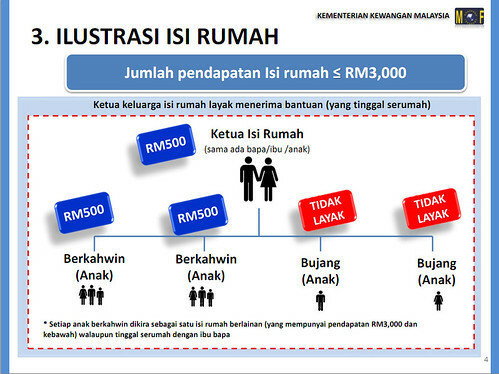 Where you can claim or apply for this Bantuan Rakyat 1Malaysia (BR1M) – RM500!? Check out the location here. Freeze on AES court cases! 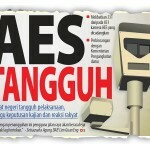 AES saman still valid? !